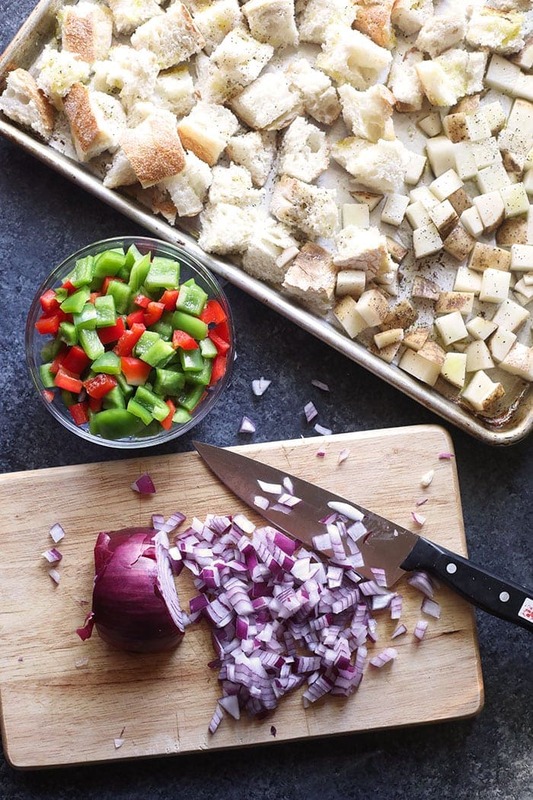 Are you still racking your brain about what healthy breakfast casserole to make for brunch this holiday season? 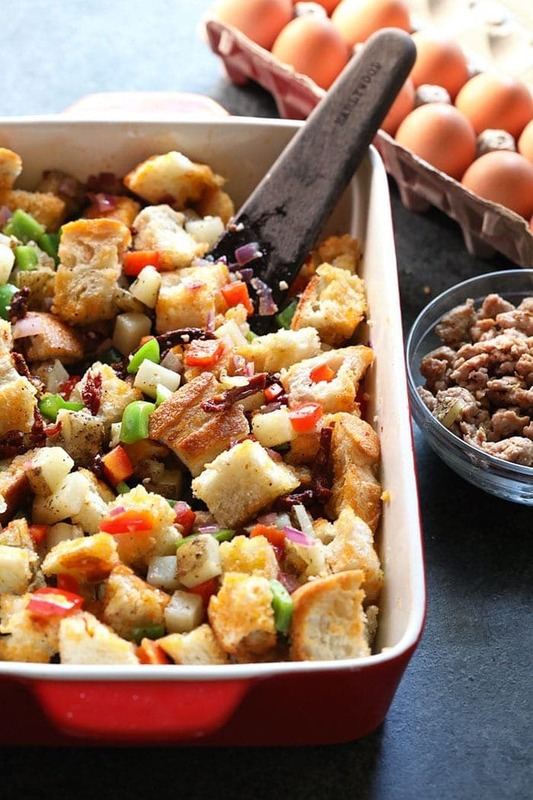 Have no fear, this spicy Italian breakfast casserole is the perfect make-ahead breakfast for your busy week or perfect for a holiday brunch to share! I don’t know about you, but the minute I see the first leaf change color in October, my mind is immediately in holiday planning mode. What am I going to be for Halloween? Where is Thanksgiving going to be? Who is in charge of the turkey? Who is making green bean casserole? Then it is immediately Christmas time. Where are we spending Christmas Eve? What are we eating for Christmas dinner? Who’s name did I draw for secret Santa? Do you feel a little crazy reading this already? Me, too. LOL. One thing I do to help me manage the holiday craziness is planning ahead. I love the cooking and baking part of the holidays so I like to plan and prep my recipes in a way where they won’t cause me stress! 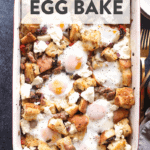 This Spicy Italian Sausage Egg Bake has been one of my go-to holiday breakfast meals for many reasons. Why? 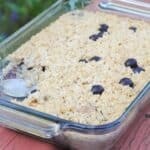 You can make this healthy breakfast casserole the night before and just bake it in the oven the morning of your event. No last minute preparation required while guests are arriving. There are many ways you can change up this recipe. If you don’t have peppers, use whatever veggies are in your fridge. The sky is the limit. If you have to serve this spicy Italian sausage breakfast casserole gluten-free, remove the bread and replace it with sweet potatoes! Need to make this dish vegetarian? Go ahead and skip the sausage and add sauteed mushrooms. You see? 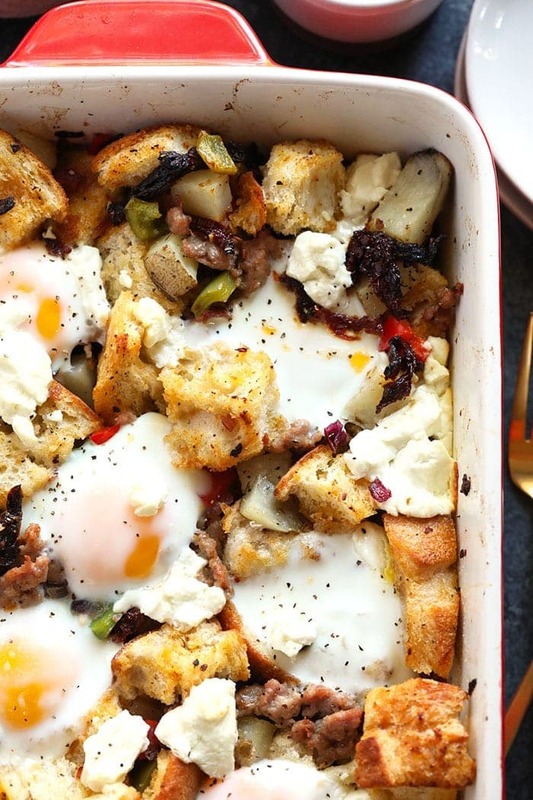 there are so many reasons to love this breakfast casserole. Not only does it ease my mind to know that breakfast is cleaned up and ready to go in the morning, but my family absolutely loves this healthy breakfast casserole. It is the #1 most requested dish and has squeezed its way into our family tradition. I mean…the goat cheese and sun dried tomato combination is everyone’s favorite. Sautee your onions, garlic, and peppers in a saute pan. It really gives your veggies an amazing flavor! Keep in mind that you can use your favorite veggies, too! 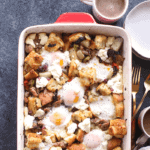 Mushrooms, eggplant, and cauliflower would all be delicious in this healthy breakfast casserole! Step Three: Crack those EGGS. 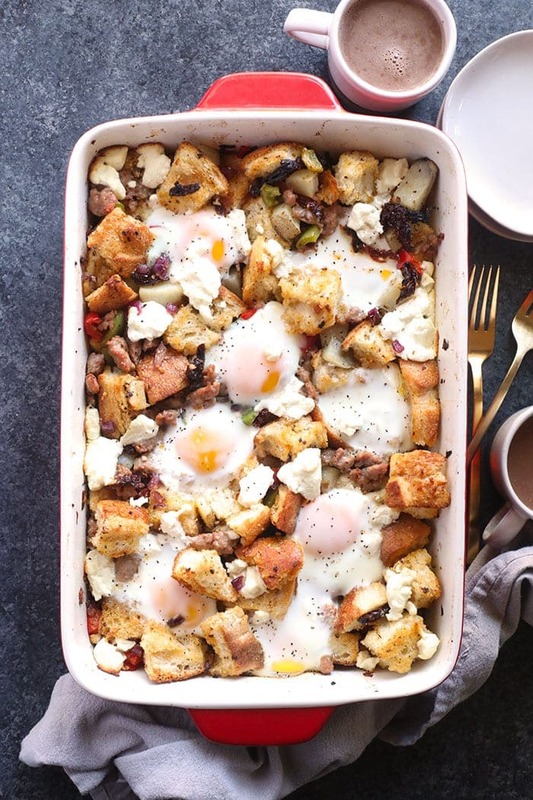 We loved oven baked eggs on Team Fit Foodie, so this Spicy Italian Sausage Breakfast Casserole is one of our favorites! You have two choices when it comes to WHEN you bake this casserole. 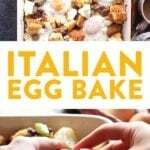 You can crack your eggs over the casserole and bake immediately. Cover and place your casserole in the refrigerator overnight and crack eggs over your casserole in the morning and bake. 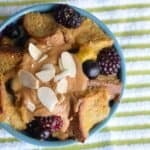 This is my favorite way to prepare and bake this dish! I love that all the flavors soak into the sourdough bread. It’s SO tasty. After you pull your breakfast casserole out of the oven, top it with goat cheese (or your favorite cheese) and enjoy! Sometimes we drizzle a little balsamic vinegarette over the top and sometimes we eat it as is! YUM. Preheat oven to 400ºF and spray a 9 x 13-inch casserole dish with nonstick cooking spray. Set aside. Next, place chopped potato on 1/4 of a baking sheet and spread the sourdough squares over the remaining section of the baking sheet. Drizzle with two tablespoons of olive oil. Place in the oven and bake for 10 minutes. Remove from oven and immediately place bread squares into your greased casserole dish. Place potatoes back in the oven for an additional 10 minutes. While potatoes are cooking heat a large skillet over medium/high heat. Add Italian sausage to the skillet and cook until pork is no longer pink. Add sausage to your greased casserole dish. Next, add onion to the same large skillet and cook on medium heat for 1-2 minutes. Add garlic, red pepper, and green pepper to onions and cook for an additional two minutes. Then, add vegetable mixture to the casserole dish. Remove potatoes from oven and lower the heat to 350ºF, then add potatoes, sun-dried tomatoes, and olive oil to your casserole dish and mix until all ingredients are combined. 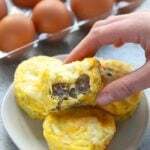 Place into the fridge overnight or skip to step 8 if you would like to bake immediately. Crack 8 eggs over the top of your casserole and sprinkle on goat cheese. 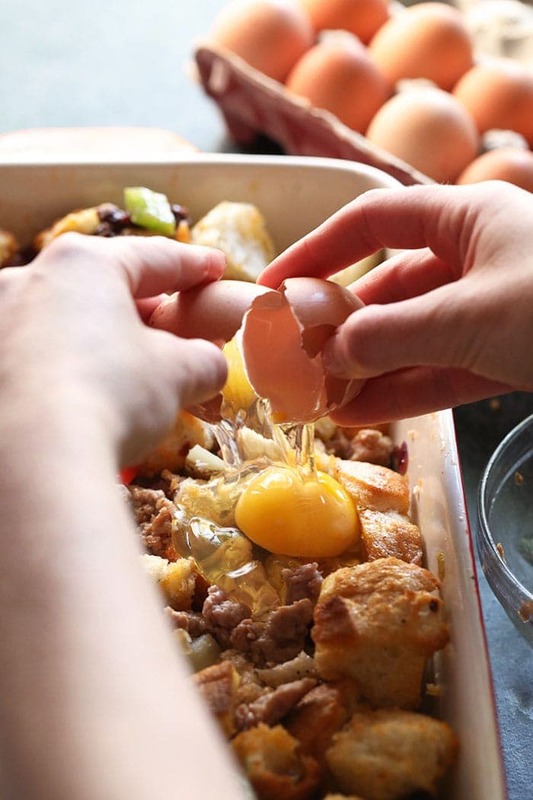 Remove tin foil from casserole dish and bake for another 15 minutes (or less if you would like runny yolks).